Under the scorching noon sun on National Highway 1A, many people from Mekong Delta travelled back to HCMC to start working tomorrow. 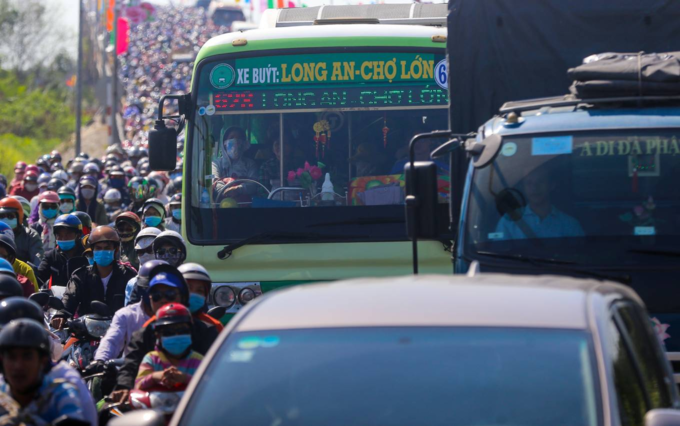 At the section passing Ben Luc District in Long An Province and Binh Chanh District, HCMC, thousands were stuck in traffic on February 10, the last day of Tet, the Lunar New Year holiday. 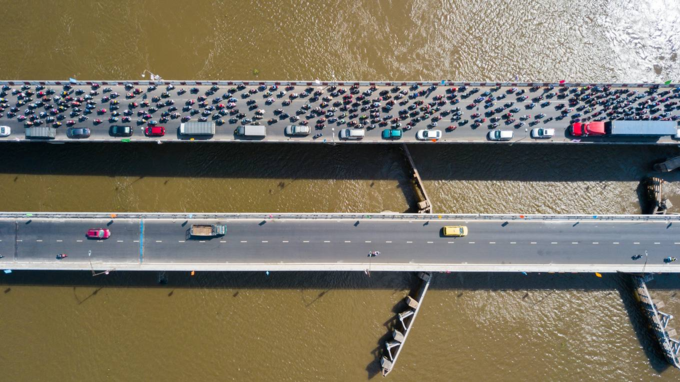 On the Ben Luc Bridge area towards HCMC, many vehicles were stuck for hours. This is the only bridge connecting Mekong Delta provinces and HCMC. The bridge is narrow, so it gets congested every Tet holiday. 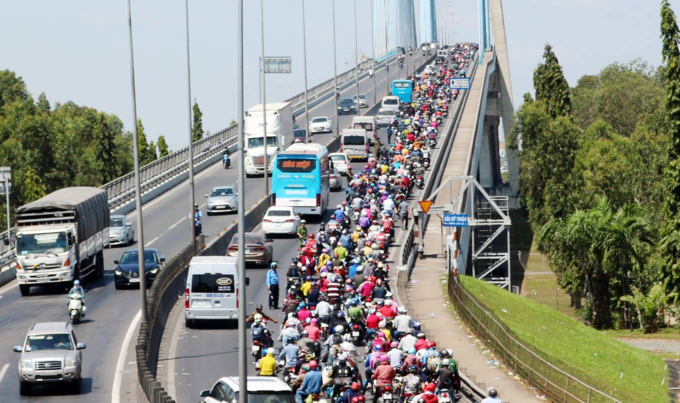 Thousands of cars and motorbikes inched ahead on the bridge in one direction while the opposite lane was almost empty. Horns were honked loudly and repeatedly as buses, cars and container trucks were stuck for hours on the road. "Nearly an hour has passed and I still cannot cross Ben Luc Bridge. Many passengers were impatient so I had to drop them off on the way to walk," said Ba, a bus driver. 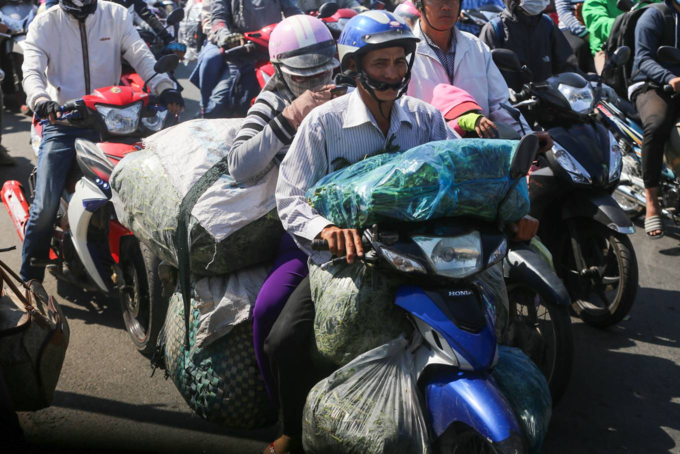 A similar situation was seen in Tien Giang Province in the area from Trung Luong junction in My Tho City to the intersection of National Highway 1A and Trung Luong Expressway. 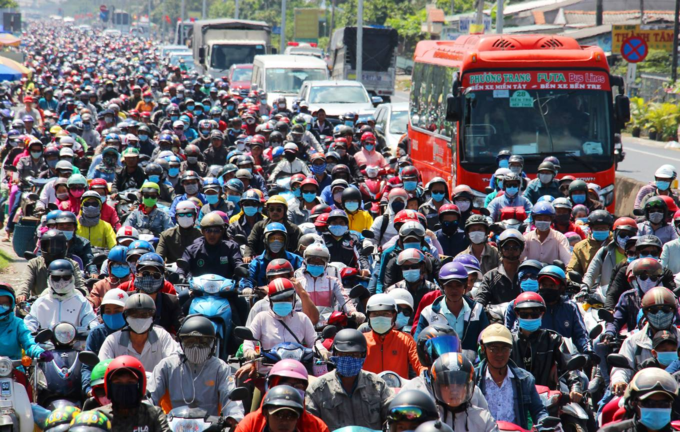 Thousands of motorbikes were stuck in long queues extending more than 10 kilometers. At several intersections, the traffic light system became useless. Cars were stuck in the middle of many motorbikes honking loudly; many people used the sidewalks. 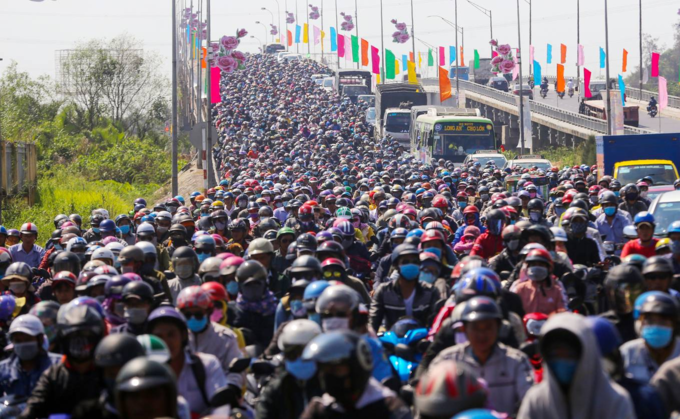 Big traffic jams were also seen on My Thuan Bridge (connecting Vinh Long and Tien Giang provinces), Can Tho Bridge (connecting Can Tho and Vinh Long provinces) and Rach Mieu Bridge (connecting Tien Giang and Ben Tre provinces). Many people carried a lot of baggage on their bicycles, including culinary specialties and vegetables from the Mekong Delta. "I was afraid that when it is cool in the afternoon, we would get stuck in traffic, as it happens every year, so my wife and I traveled with our children at noon, but it is even more tiring. 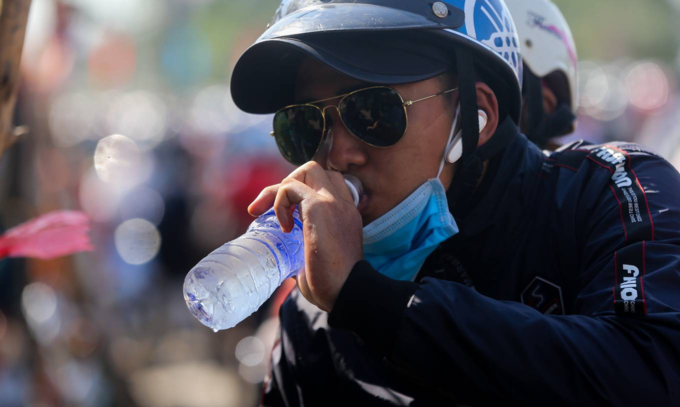 Travelling from Vinh Long to My Tho City in hot, dusty conditions took 4 hours, while normally, it only takes 2 hours," said Nguyen Van Tai, a motorbike driver stuck in the traffic. Lien was returning to HCMC from Soc Trang Province. 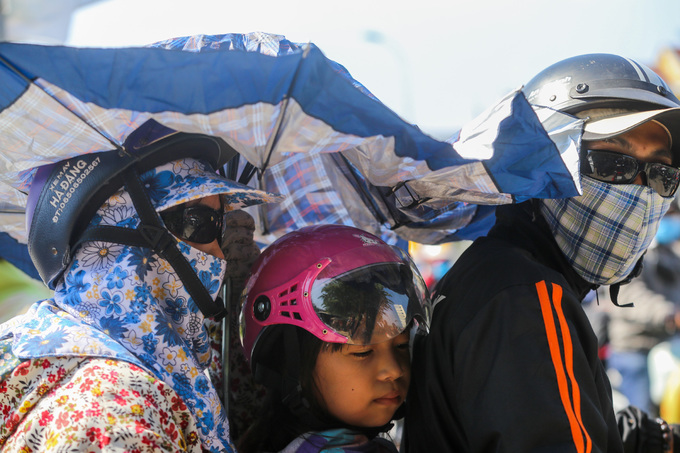 Her daughter has fallen asleep on the bike, and the mother has to take an umbrella to shield her from the sunlight. "We started out from Soc Trang at 8 a.m. but couldn’t reach Saigon even by afternoon." Tung and his wife from Soc Trang Province brought their pet home to celebrate the Tet holiday as there was no one to take care of it. "I set off early in the morning in order to have some time to rest before working. Travelling back home was easy but the road back to the city has been too challenging. 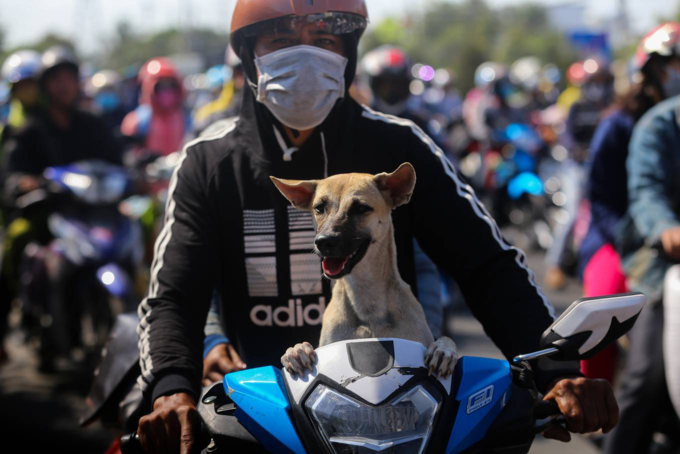 The motorbike has stood still under the hot midday sun, we have stopped several times to buy water for both us and the dog," Tung said. 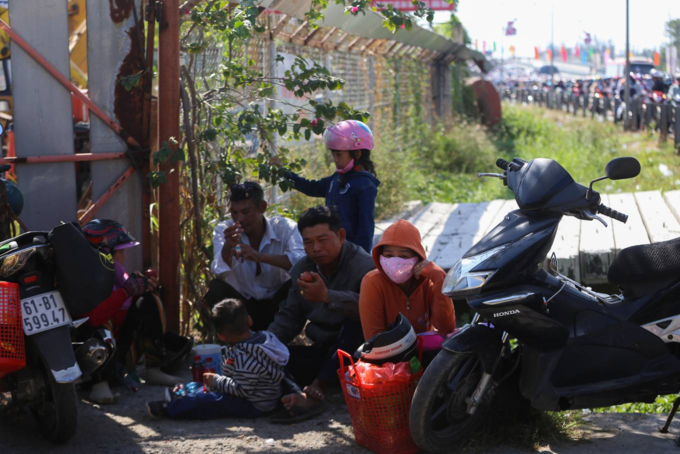 Phuong Dung rested on her motorbike on National Highway 1A as she returned to HCMC with her daughter. Most of the people wore masks and stopped frequently to drink water. 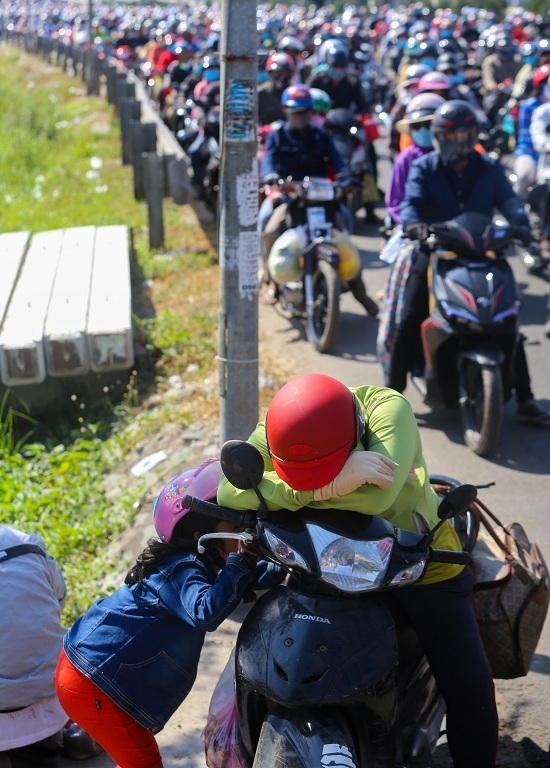 Due to the prolonged traffic jams, many motorcyclists chose to eat, drink and rest by the roadside. "This is the sixth stop we are taking while returning from Vinh Long to HCMC. 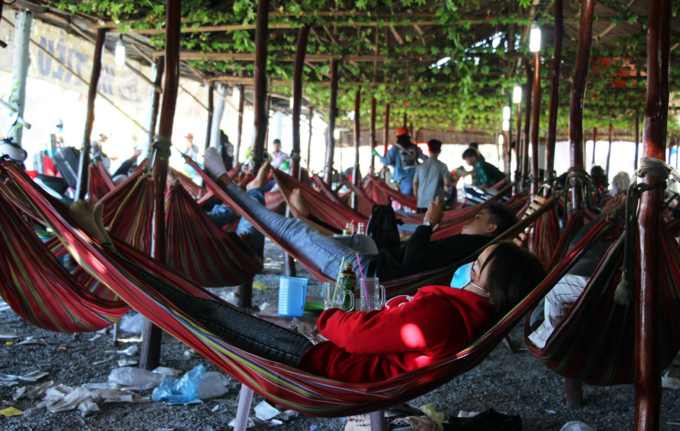 In the morning, we got stuck on My Thuan Bridge, and when we got close to Saigon, we got stuck again," said Kim Huy. The tiring journey promoted many people to rest in hammock cafes on the way. All such roadside cafes were crowded. Friday and Saturday also saw many roads blocked as people returned to HCMC, but Sunday caused the worst gridlocks. This year, Vietnam's Lunar New Year holiday, the longest of the year, lasted from February 2 to February 10.